For an export success story with a difference, I shared the secrets of Vanners, specialist silk weavers in a Suffolk market town. They’ve been exporting worldwide since 1740. 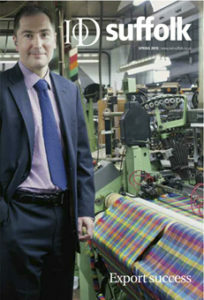 I visited the Vanners silk weaving mills in Sudbury to talk to MD Rick Stevenson. I found out how the company has survived – and thrived – in a difficult market, beating off stiff competition from Europe and the Far East.